To be able to answer the questions of needs of traffic participants and of limiting conditions of the urban environment and to be able to implement the aspired innovation, the Research Training Group accomplishes an ambitious, but realistic research program based on six interdisciplinary research areas (image 2). 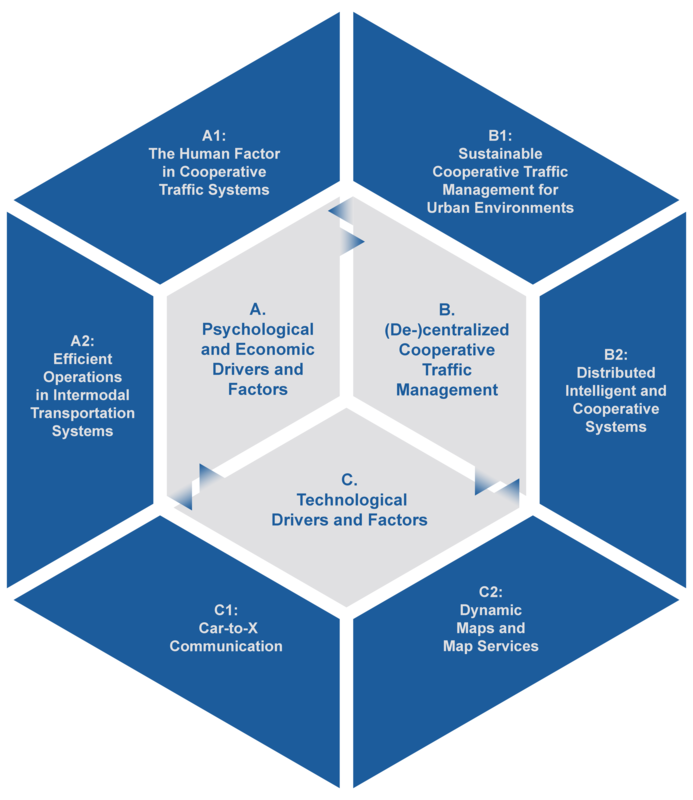 The research areas The human factor in cooperative traffic systems (A1) and Efficient operations in intermodal transportation systems (A2) focus psychological and economic drivers and factors (Field A) of (de-)centralized cooperative traffic management. Research field B put emphases on key models and key methods of (de-)centralized cooperative traffic management which are investigated in the research areas (De-)centralized cooperative traffic management(B1) and Distributed intelligent and cooperative systems (B2). Research Field C concentrates on technological drivers and factors such as innovative information and communication services and focuses on Car-to-X communication (C1) and Dynamic maps and map services (C2). These technological factors provide general information and functions for (de-)centralized cooperative traffic management.